By Olivia Dove (University of Queensland, Brisbane, Australia). What a wonderful woman she was! And she lived in the land called Oz. There are two myths that need to be dispelled about university students. The first one is that ‘students don’t do any work, university is just one big party’. Sure enough, this is true for a minority, but even they have experienced long shifts in the library with a much-appreciated coffee. Lecture halls are usually filled, even for the morning sessions. And some students even participate in extra-curricular studies such as the poetry above (specially written for you all by an International House ‘housie’). When abroad, the second myth that you will find working against you, as an international student, is that ‘exchange kids don’t need to work hard – they only have to pass’. This is only sometimes true. When studying abroad, your grades could count as part of your final degree mark or you may just need to pass, and this depends on: your university, your faculty and your degree programme. For me, as a one-semester abroad Zoologist, my grades in Australia will be the first grades that go towards my degree. Scary stuff. Therefore, to secure a future looking at cuddly (and not-so-cuddly) animals, I must work hard whilst enjoying my time here in Australia. So, what is studying here like? What are the differences between England and Australia? UoM (University of Manchester) starts at 9am: a sensible, well-thought out time. UQ (University of Queensland) begins at 8am. Labcoats are not compulsory in every lab practical at UQ. Multi-coloured, funky labcoats are allowed at UQ. Laboratories here have a Mac computer at every single desk (It feels like you’re working at the Genius Bar at Apple). Students wear flip-flops around campus at UQ (or ‘thongs’ as they call them, which leads to many confusing and awkward moments). There are more places to buy coffee at UQ. There are lots and lots and lots more areas to work outside at UQ, as well as nicer weather for it, too. Essays and assignments seem to be shorter and less frequent at UQ. UQ has mid-semester exams. My final exams at UoM in my 1st Year were worth 85-95% of my course grades; here they are worth a maximum 50%. Which, believe me, makes a welcome change. Exams can be scheduled for Saturdays at UQ. Exams, at least mid-semesters, can take place at UQ in lecture halls with one lecturer watching 300+ students. Handing in an assignment includes a bar code and deposit slot. Each course had 3 lectures a week at UQ, as opposed to 2 a week at UoM (though this is different for every course). Attendance at lectures is laid-back, but tutorials are a must. Lab practicals are mostly 3 hours long. The library is nearly always full, except between 10pm-9am and weekends. Lecturers allow you to address them by their first name. Students take a lot of naps. Students sometimes even take a nap during lectures. Lecture slides and recordings are posted on an online Blackboard site. Questions throughout lectures are encouraged. Both universities use Turn-it-in software to assess plagiarism. Students prefer to study in packs. If planning a semester abroad, the main thing for you to remember to do is thoroughly research your courses. If you don’t want a lot of lab hours, or you want courses with essay assignments instead of exams, these can both be avoided by making sure you read the course descriptions. Also, I would highly recommend studying courses that you can only study when abroad, but this goes without saying. To conclude this semi-intellectual post, I enjoy studying abroad. And, trust me, you will, too. 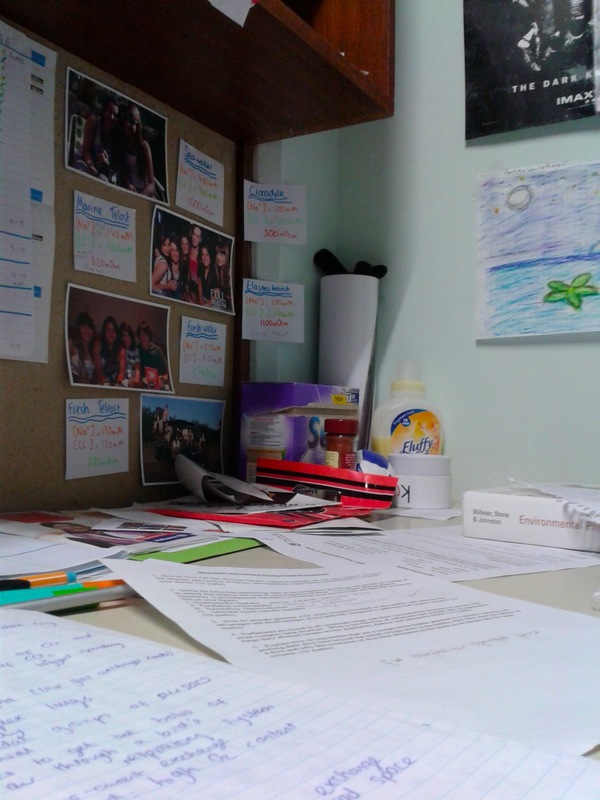 My desk covered in mid-sem revision. Oh, the joys (worth it though).